It would be impossible for me to write this post without spoiling the latest episode, so go ahead and watch Rapunzel and the Great Tree if you haven't seen it yet before reading on. I was surprised that this hour-long episode was not promoted as a major special at all as far as I could tell. Rapunzel and the Great Tree was a crucial turning point in the plot and should have been treated as such. It brought back all of the things that we have been waiting since the season premiere to learn more about, such as the character of Adira, the significance of Varian's father, the meaning of the moon symbol next to the Sun Drop symbol on Adira's scroll, and the black rocks, which created the events that kicked off the series from the very beginning. Rapunzel and her friends are traveling to a place called the Dark Kingdom, which is where the mysterious rocks originate from. If that doesn't sound foreboding enough already, Disney also took some pretty big risks in the latest special that might make some people question if Rapunzel is really as innocent and happy-go-lucky as she appears. Brace yourselves, folks. We are now entering spoiler territory from whence there is no return. One of the biggest revelations in this special is the Moonstone, the opposing force of Rapunzel's Sun Drop Flower that gave her hair its magical properties in the original movie. Since the Sun Drop contains healing magic, it should come as no surprise that Moonstone's power brings death and destruction. What does come as a surprise is that as soon as Rapunzel learns the incantation for the Moonstone, she decides to try it, without even considering what it might do to the people traveling with her that she cares about so dearly. The incantation turns her hair black and takes full control over her body so that she is unable to stop casting the spell of her own volition. It is a little disturbing and hard to swallow that such a happy-go-lucky princess who believes in love, peace, and the good in all people would want to try out a magical incantation that begins with the words "wither and decay," but who am I to judge? Another centralized theme of this special was the relationship between Rapunzel and her badass lady-in-waiting, Cassandra. Cassandra started out as more of a foil character to both Rapunzel and Eugene, but in Rapunzel and the Great Tree, Rapunzel proves that she has more in common with Cass than anyone had anticipated, and I don't just mean her new hair color. In the beginning, Rapunzel followed Cassandra's guidance to learn about the ways of the world outside her tower, but now that she has been traveling for so long, she finally decides to exert her power as the princess and future queen of Corona. This leads to a beautiful new anthem for Cassandra called "Waiting in the Wings" about all of the hardships of being a lady-in-waiting. In addition to her take-charge attitude, Cassandra had always been the pessimist/realist of the group while Rapunzel was an unapologetic optimist who insisted on finding the most altruistic solution to any problem. Not anymore. In this episode, she willingly chooses to recite the deadly incantation again at a pivotal moment despite now being fully aware of the consequences. 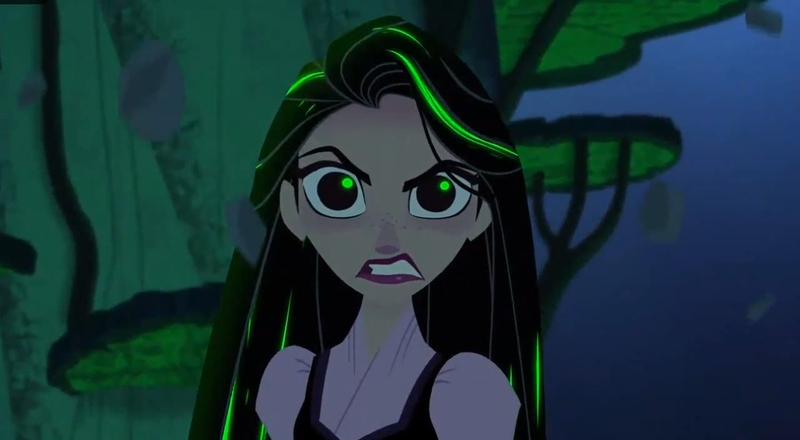 It looks like Cassandra has some competition for the role of the dark and brooding goth girl in the Tangled universe. I have to say that I was not expecting such a light and cheerful series to take a turn in this direction. By Disney standards, this episode was quite dark. It was revealed from the beginning that Rapunzel's impossibly long hair took new and mysterious properties from the healing magic it had before, but they could have found a way to reveal those properties without making Rapunzel channel dark magic through her own free will. Cassandra warns her not to make reckless decisions at the beginning the special, but a princess being reckless is more akin to her trading her voice to the sea witch for legs than casting magic that will inevitably destroy everything in her path. Yes, change is a necessary part of life, but one of the things that make princesses so timeless is that they never lose that innocence and optimism that so many of the rest of us do as we grow older. It seemed like far too drastic of a change to transform Rapunzel from a bright sun into a poisonous moon. Has Rapunzel gone from Starfire to Raven overnight? Even though the black hair is not a permanent change, it is a deadly power that she can call upon whenever she sees fit. I'm sure there will be plenty of light-hearted filler episodes between now and the finale where the moon magic isn't even mentioned, but it will be sure to come up again in the next special. As the characters approach the foreboding Dark Kingdom, more deadly secrets will likely be revealed. I hope that our starry-eyed princess hearts will be able to handle them. To be honest I feel like this episode made Rapunzel too edgy for me (which is a strange thing to say) but no in a "cool" edgy way but more in a "pathetic teen trying to be dark" way. I really liked the first season and I was sort of excited for Rapunzel to find out more about her powers but I feel like the writers are slowly going a dark path that isn't necessary to take. Do Tangled really need a plot that slowly gets bigger and more serious? In any case my interest for Tangled the series has dropped and I doubt I'll comer back soon. Good thing I've Star vs the Forces of Evil to feed my magical princesses needs. It definitely did get super edgy with no real buildup. I'm hoping the future episodes won't be this dark. I personally could never get into Star vs. the Forces Evil. I thought she was a little too ditzy and chaotic for me, but I did like Marco. Thanks for stopping by! 1. This show is REALLY hitting the animation age ghetto trope hard! It's getting a bit too scary and confusing for the little girls who would be the prime consumers of the Disney Rapunzel products and skewing more towards pre-teens and older girls most of whom MIGHT want to visit Disney World/Disney Land parks once every couple years and that's it (most products might make many of them scoff that "Those things are just for babies!" and turn away). For want a better comparison, Elena of Avalor still has some dark themes but keeps a balance that all viewers, no matter what they're age, can watch and enjoy. Sure the youngest fans might have some questions but they can still enjoy that show even if they don't understand certain things. But dark death Raps in this ep was SO SCARY that she makes the monsters in The Black Cauldron (an animated 80's Disney movie obviously aimed at the teenage/YA audience) seem tame by comparison. 2. Raps is just getting way too powerful! It's one thing to have her healing powers and then super-strength (which could represent a life force) then now she also has destruction powers (death-time!)? The writers may have to come up with something snappy or she'll become an omnipotent G-ddess that is hard to route or feel suspense for. Yeah, Disney's animated shows have been really getting into the Netflix era in which everything has heavy continuity and recurring characters that require you to watch everything in order. The problem is that when they have multiple month long hiatuses between episodes, it gets really hard for me to remember everything and everyone they reference from something I saw months ago. I think the only way to really enjoy it would be to binge it all in one or two sittings. I do think they've gotten smart and realized that people in their 20s and 30s watch this stuff too and are trying to pander to them and just hope that modern kids don't get scared as easily as they used to. I guess it just depends on the kid. Elena of Avalor is still technically considered a Disney Junior show, while Tangled is Disney Channel, so it's not allowed to get as dark. At the same time, Elena's creator, Craig Gerber, posted on Twitter yesterday that Elena is a huge badass for murdering Shuriki point blank at the end of the Song of the Sirenas special, which was something that I had completely forgotten about and needed to watch again. They made it okay by Disney Junior standards by having her turn into a magic jewel instead of a dead body, but when I saw it, I just assumed someone was going to release her from the jewel so she wasn't really dead. Craig says she is, so I guess it's darker than I thought. Regarding your second concern, Rapunzel doesn't have her healing powers in the series because her hair was restored by the Moonstone instead of the Sun Drop Flower, so now it only has killing powers. She isn't really all-powerful if she can only do one or the other, but I definitely prefer the healing powers over this. On the other hand, Sofia the First basically became an all-powerful goddess by the end of her series. She tapped into insane powers from her amulet AND became a super powerful guardian of the Mystic Isles. There's really no limit to what Magical Girl princesses can do anymore. Season 2 of She-Ra Is Coming! Sequels and Remakes and Trailers, Oh My!